A new poll shows that most Palestinians no longer support the “two state solution,” but they do support violence against Israel. A new poll shows that most Palestinians no longer support the “two state solution,” which entails lopping off Judea, Samaria, and most of Jerusalem from Israel and establishing an Arab state. According to the poll conducted by the Palestinian Center for Policy and Survey Research, 51% of Palestinian Authority residents – including in PA-controlled areas of Judea and Samaria, and of Gaza – do not believe they can achieve their goals via negotiation. However, that doesn't mean that Palestinians have given up on their goal of establishing a Palestinian state – either on part or all of the Land of Israel. 42% said that achieving such a state could be achieved only by violence. 29% said that talks were preferable. According to the poll, 65% said they believed that the establishment of a Palestinian state in Judea, Samaria, and Jerusalem was no longer feasible because of the large numbers of Jews who now live in Judea and Samaria. The poll did not ask whether Palestinians supported the idea of Israel annexing all of Judea and Samaria and providing them with citizenship. In a previous poll by the organization taken three months ago, 51% of those surveyed said they still supported the negotiation process. The poll also showed that 65% of Palestinians have had enough of Mahmoud Abbas. The octogenarian PA chief, who is now in his tenth year as PA Chairman– despite being elected for only four years – has threatened several times in the past several months to resign his position, with his reasons varying from “Israeli intransigence” to his saying that he was getting too old for the job. Abbas dropped out of negotiations with Israel last year in the wake of Operation Protective Edge, and has refused to return unless Israel accepts his ultimatums – a cessation of all building in Judea and Samaria, and a pledge to withdraw from areas of Jerusalem liberated in the 1967 Six Day War. 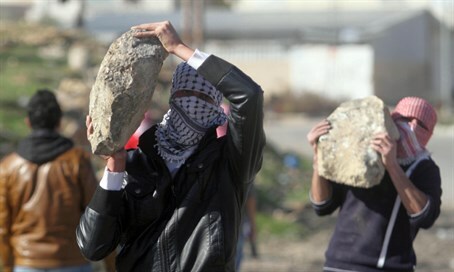 Previous polls have shown that Palestinians are no fans of the PA. In a survey in June, 79% said there was corruption in PA institutions, while only 23% in Judea-Samaria and 18% in Gaza said there was freedom of the press. No less than 48% believe the PA is a burden on the Palestinian Arabs, and 76% called for the police forces in Gaza and Judea-Samaria to be unified, thereby taking police control away from Hamas in Gaza.